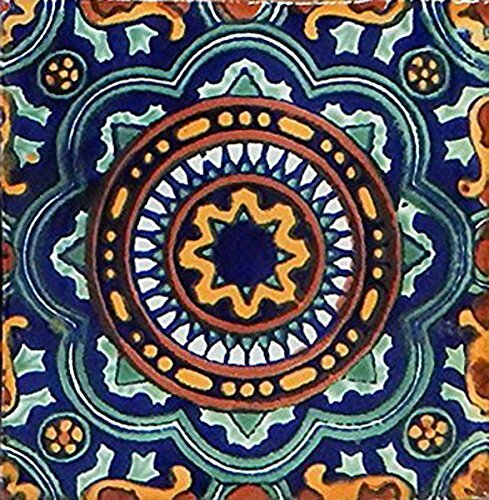 6 Mexican Talavera Tiles on 6" x 6" made in Mexico. The same as the picture. Tiles may present slight variations on color, designs, and size due to its handmade process. These are not seconds. Tiles are not FROST PROOF. Tiles are suitable for bathroom walls, counter tops, backsplash, stairs, etc No matter how big your order, we can fill it! Tiles may present slight variations on color, designs and size due to its handmade process. If you have any questions about this product by COLOR Y TRADICIÓN, contact us by completing and submitting the form below. If you are looking for a specif part number, please include it with your message.